Lead paint and toxic mold are the two most prevalent and serious environmental hazards in residential housing. You need to be aware of your obligation to disclose any existence of lead paint or toxic mold in or on your rental property and your responsibilities in protecting residents from exposure to these toxic substances. Obey any state or local lead hazard reduction laws, some of which require testing and careful maintenance or removal of lead paint. Disclose known lead-based paint hazards on your property. Provide residents with an information pamphlet from the EPA titled “Protect Your Family from Lead in Your Home.” You can get this pamphlet online in both English and Spanish. The pamphlet is also available in other languages. 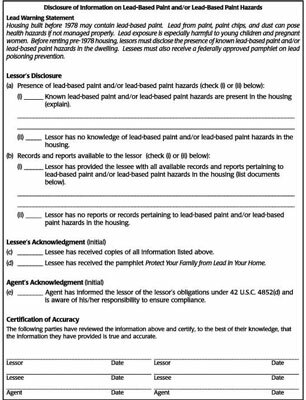 A few states (including California and Massachusetts) have their own pamphlets on lead-based paint hazards that the EPA has authorized for distribution. 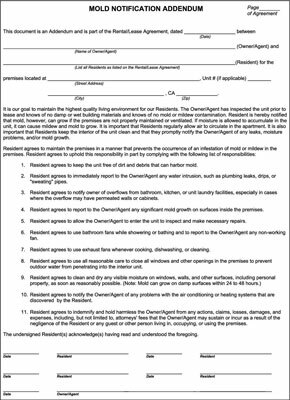 Whichever pamphlet you provide your residents, keep a copy of the disclosure form signed and dated by the residents. Contact the EPA or your state health and environmental agency for specific information. If you’re advised that your property is exempt, be sure to receive written verification before ceasing to follow the federal requirements. Don’t try to remove lead paint yourself. Scraping or sanding the lead paint releases it into the air and surrounding area, making it much more hazardous. Painting over the paint merely masks the underlying problem. If your property has lead-based paint, hire a licensed contractor to inspect its condition and advise you on measures to take. Government testers have been known to pose as prospective residents, and federal agents have scoured leasing and maintenance records looking for evidence that property owners or managers knew or should have known about the existence of lead-based paint hazards on their property. For more information about lead paint, review the extensive resources available from the EPA and the National Lead Information Center (NLIC) by calling 800-424-5323. Mold is the common term for a variety of fungi commonly found in nature. Mold is everywhere, but not all of it is toxic to everyone. However, the effect of toxic mold on health has become an increasing concern for rental property owners and managers. According to the EPA, toxic mold has the potential to cause health problems for some persons who have asthma or are allergic to certain types of mold. For these individuals, contact with specific molds can cause allergic responses such as sneezing, runny nose, red eyes, and skin rash. But toxic mold can also irritate the eyes, skin, nose, throat, and lungs of people without allergies. Common problems that give rise to mold and mildew are leaks and poor ventilation, especially inside bath and shower enclosures. If, despite their best efforts, your tenants suspect any issues of elevated moisture or smell or see any mildew or mold, they should notify you immediately. You must take claims of visible mold seriously. Follow the EPA guidelines regarding mold removal and consult with experts if the problem is severe and persistent. “Guidelines on Assessment and Remediation of Fungi in Indoor Environments”: This document, published by New York City’s Department of Health and Mental Hygiene, is widely considered to be the first comprehensive document to establish best practices for mold assessment and remediation. “A Brief Guide to Mold, Moisture, and Your Home”: This publication, produced by the EPA, is an excellent resource for both rental property owners and tenants. It’s available at no charge from the EPA at. Whenever you’re planning a major renovation that’s likely to kick up a lot of dust, inform residents who live nearby about your plans, the possible risks of exposure to airborne substances, any safety concerns, and precautions that you and your contractors will take to protect the residents’ health and safety. Let them know if they need to avoid the area under construction or if any alternate routes are available. Make sure your maintenance staff or the contractors you hire follow the required precautions to reduce or eliminate resident exposure to airborne substances.